El left the garden when the evening star appeared. The woman and the man lay in the grass beneath the eucalyptus tree, and its branches moved with the damp river breeze. The woman turned to the man and asked, “What did El mean by ‘change?’” She did not understand, for the leaves in the garden did not yet fall, and the oranges and pears did not yet rot. The man did not answer her. He was asleep. The woman rose and walked toward the pomegranate tree—the tree that El said could change her. “You might never know what change is,” a voice said near her ear. The woman looked up. A long, shimmering green serpent, burnished silver with moonlight, had wound itself around a limb of the tree. “Could you advise me?” the woman asked. The woman did not know. She turned away from the tree and returned to the man, who was still sleeping. As she lay beside him, the woman wondered, “He sleeps, so why can’t I sleep too?” But since the woman was not tired, she stayed awake and thought about the serpent whom she could still see intertwined in the branches of the pomegranate tree. After several hours had passed, the woman was hungry. She was careful not to disturb the man’s sleep as she untangled her fingers from his hair. She walked over to a peach tree. However, the peach she ate did not satisfy her. She devoured a pineapple, and then a handful of brown olives, but after sampling fruits from almost every plant in the garden, she was still ravenous. Then, the woman approached the tree of change and reached out for one of its gold-tinged, rosy fruits. As she began to pluck the pomegranate from the branch, the serpent slid over her hand and wound itself around her wrist. “He wouldn’t,” the woman said. “I don’t believe you,” the woman said. She reached for the fruit again. 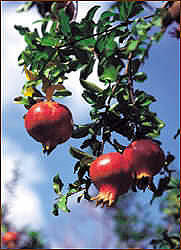 The woman pulled the pomegranate from the tree, bit into it, and swallowed the rind, pulp and seeds. The serpent squeezed its body tightly around the woman’s neck. “Now, you will die,” it said. Very nice so far! What is change and why do I fear it so? It's a midrash. I love good midrashim. Did you ever check out those Sandy Eisenberg sasso books I told you about? I don't recall you telling me about them, but I've just gone and ordered some from the library. I'm reading The Forestwife right now, by the way, and I've got the Nine Days Queen out from the library. Speaking of Midrashim, are you acquainted with When the Beginning Began, by Julius Lester? Also, a book that I just found hilarious (though it got a bit draggy toward the end) was Lamb: The Gospel According to Biff, Christ's Childhood Pal, by Christopher Moore. No, I don't know those. I'll have to check them. We've used these 2 other good ones in First Day School (don't remember the authors) called Before There Was A Before and Does God Have A Big Toe? OOOhhh...how are you liking The Forestwife? It's like...a feiminist text. I so adore it.